If your visit to Ternate, North Maluku, is not complete if taking the time did not stop at the tourist attraction of Lake Tolire. 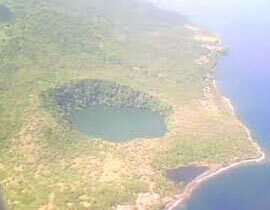 The lake is located about 10 km from the central city of Ternate, in addition to the unique shape also has an interesting legend. Lake Tolire be under the foot of Mount Gamalama, the highest volcano in North Maluku. The lake itself consists of two pieces. Local people call it the Great Lakes and Lake Tolire Tolire Small. The distance between them is only about 200 meters. From both these lakes, the Great Lakes Tolire has its own uniqueness. This lake resembles a giant pan. From the top to the edge of the lake water surface with a depth of about 50 meters and a width of about 5 hectares. While the depth of the lake itself is so far unknown. Until now no one has measured the depth of this lake. But according to ancestral stories, miles deep and deal directly with the sea. Tolire Great Lakes had a variety of freshwater fish live in it. However, local residents no one dares to catch fish or bathe in the lake. They believe that the lake where the water is yellowish brown, the crocodile inhabited by many demons. nother uniqueness of this lake is that throw something into the lake, however the strength of the throw by using stone or other object, for example, will never touch the water of the lake. And when the throw from the edge of the lake, the lake looks under the feet of the thrower. Perhaps those who first visited the lake, would not believe the facts. However, they may try to throw it after buying the stone that many are sold in the lake at Rp 1,000 for the five seed stone. So far, no one was able to throw the stones to touch the surface of the lake water. According to local residents, many treasures are stored at the base of the Great Lakes Tolire. This treasure belongs to the people when the Portuguese ruled the Sultanate of Ternate Ternate the 15th century. Community Ternate was a lot of waste of valuable property into the lake so as not deprived of the Portuguese army. Lake Tolire Large and Small Tolire, according to local stories, used to be a village where people live in prosperity. The village was later condemned to the lake by the ruler of the universe, because one of his father in the village were knocked up her daughter alone. When father and daughter who dihamilinya it will escape out the village, the land suddenly dropped where they stood and turned into a lake. Great Lakes Tolire believed to be the place of the father. While Tolire Small Lake is believed to be where the girl. To visit the Lake Tolire Tolire Large and Small, is not difficult. 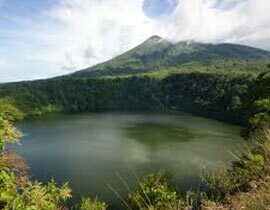 To reach it only takes about 10 minutes from downtown Ternate, using a chartered car Rp 250,000 per day, or hire a motorbike motorcycle taxis with fare of Rp 10,000 per hour. When you visit the Great Lakes Tolire, many other attractions to be enjoyed, such as the beautiful panorama of Mount Gamalama peak, a number of relics of the Portuguese fort and eat Babullah Sultan, Sultan of Ternate, the most famous - who are on the road to the lake. In addition, `we` can also enjoy the beauty of white sand beach Sulamadaha, located only about three kilomerer of Tolire Great Lakes. From here, visitors can also hire a boat to fish or go diving panaroma see the beauty beneath the sea around the beach.